Brentford FC CST Soccer Schools are open to boys & girls aged 5-12 years and focus on technical and skills development.In the morning participants take part in training sessions whilst the afternoons are dedicated to small-sided development games. The courses are a great way for youngsters to make new friends and take part in excellent football and sporting fun! Our holiday courses offer exceptional value for money and guarantee your child the opportunity to have fun whilst learning in a safe and secure environment. All of our coaching staff are FA qualified and have completed their Safeguarding Children, CRB and Emergency Aid certificates. 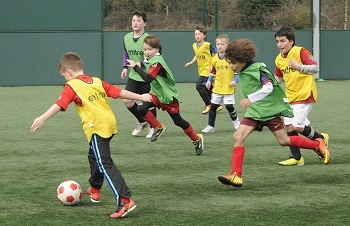 Parents should note that our Saturday Clubs and Soccer Schools are open to participants of all abilities. Chiswick School - online bookings for all courses close at 12noon on the Sunday prior to the start of that weeks courses. Goals Osterley - online bookings for all courses close at 12noon on the Wednesday prior to the start of that week's courses. After this date the early bird/online booking will be closed. The boking fee will revert to the full £20 per child per day fee and will only be available at the venue on the day of the camp. The booking deadline allows for us to plan coaching staff ratios and prepare registers prior to the course start.Both prices include one adult and one junior ticket to a Brentford FC League One home game season 2013/14 (No alternative games available). Additional matchday tickets may be purchased from the Trust at a discounted rate. Please note due to the amount of courses we have running this summer we have split the bookings page into 2 parts.